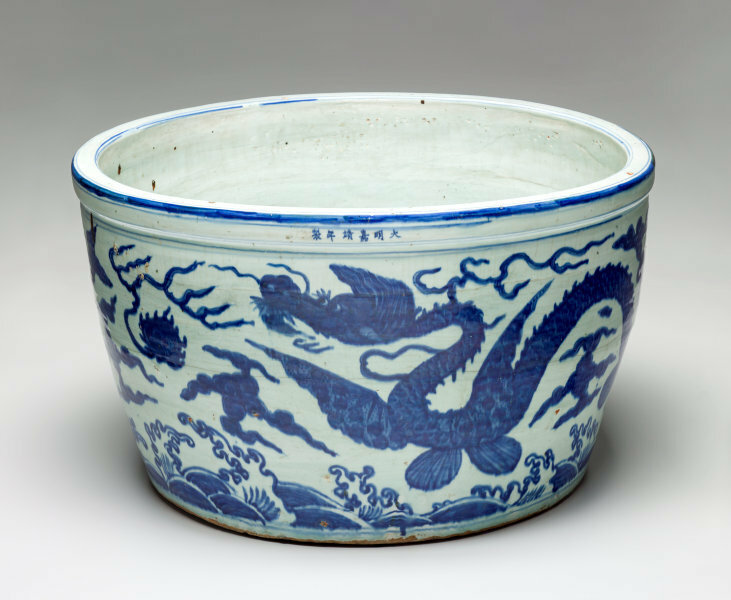 The large porcelain fish bowl is from the great ceramic centre of Jingdezhen in Jiangxi where the majority of Imperial porcelain was made from the early 15th to the 20th century. Apart from the technical achievement in potting and firing such a large and heavy porcelain vessel, it is an admirable example of the use of cobalt as an underglaze blue pigment, the most popular of all decorative colours on Chinese porcelain. Fish bowls were a common feature in Chinese gardens and courtyards and the large ones were much in demand. Some were said to measure up to three feet in diameter and this one is a little over two feet. Losses in the kilns during the firing of such large bowls must have been very heavy, and at times the Court's demands exceed the potters' ability to supply. There is a legend that at one such period during the Ming dynasty, a potter named Tong sacrificed himself by jumping into the kiln fire-hole so that the bowls would be fired perfectly. Tong achieved immortality by becoming the patron saint of potters. This fish bowl is painted in the particularly vivid underglaze blue that is characteristic of the Jiajing period (1522-66), the six character mark of which will be found written in a single line below the rim. The major feature of the underglaze blue design on the exterior is two aquatic dragons with fins, a less common variety than the type with legs and claws. J.H.Myrtle, 'Chinese Ceramics', AGNSW Quarterly, July 1965, pg.246.